What made the experience of listening to Learn German: By Reading Fantasy (German Edition) the most enjoyable? 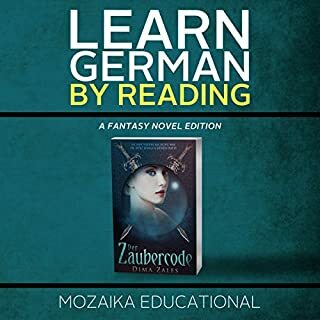 This audio/textbook - Learn German: by Reading Fantasy - is the ideal learning material for fantasy fans who are interested in improving their skills in German language at the same time. The educational strategy consists of 'immersing' the learner in the story in the simple, well written and pleasantly narrated target language, and only after that, the learner is invited to listen and read the same part of the story in his native language. By daily practicing the listening and reading to the right extent (one to two chapters a day), I can well imagine the learner being able to fully get the main ideas of most sentences, and the daily struggle and efforts will soon show results, by helping the learner to hear out specific, new words and select them for the unconscious memorizing process. However, I have to say that the language level may be too difficult for pure beginners, and I assume that this book is intended for people who have already acquired some basics in German, because I believe only then, the quick learning potential can be exploited at full extent. Furthermore, the learner is not invited to speak and discuss the story in German, as far as my view on this goes, I think it would be a great idea to assure an internet platform for instance, where readers can exchange their impressions and theories about the story. Nevertheless, I am convinced that the method of combining interests (fantasy) and learning (German) is a great educational idea, and great learning benefits can therefore be promised.